Below I argue that the collective unconscious has already made the choice for you: it is going to be pink. Fear not. We will easily differentiate ourselves from warm and fluffy pink slippers. Our color is pink on black. Closer to purple, actually. We have good heritage: purple with white was the color of kings. But kings are no more, so let’s admit it: People think that “spooky” quantum phenomena have a purple glow around them. The disaster movie “Quantum Apocalypse” has a mysterious purple vortex approach Earth. Sci-fi now has “quantum cannons” shooting pink aura at the enemies, unleashing the chaos of uncertainty. You can’t fly your battlecruiser if you’re no longer certain you still have a battlecruiser. Well, you are reading a science blog, not a fashion magazine. The latter would feed its readers a collection of random examples and speculations, while we go looking for underlying principle. Alas, nobody knows how things get into the collective unconscious, nor are there any reliable ways to map it out. 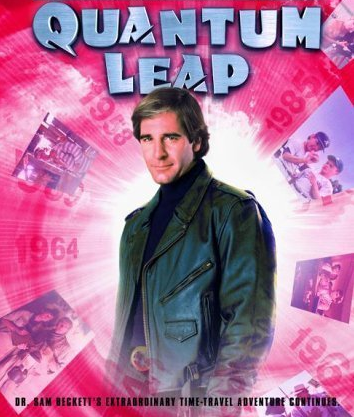 (Maybe it had to be two decades since the “Quantum Leap” TV show ended for people to forget the “blue flash”.) Instead, let us consciously find the relationship between pink and quantum. I’m talking about pink noise. If you have light with frequency distribution , where is the frequency of the light-wave, it looks pink. The reason is that the color of an object is determined by the distribution of wavelengths of the electromagnetic waves emitted by the object. Since wavelength is inversely proportional to frequency (why? ), colors corresponding to lower wavelengths dominate a power spectrum, because the amount of color mixed into this type of frequency distribution is the area under the curve , so the higher frequencies end up with a larger representation (that is, the smaller range – Hz contributes the same area as the much larger range – Hz, in a power spectrum). And guess which visible color has the lowest wavelength… purple! Pink is what we see when purple is mixed with the rest of the colors according to a frequency distribution. Which is why the color pink seems to dilute purple with softer hues of red! where is the frequency of a quantum harmonic oscillator, is the temperature of the environment and is the hyperbolic cotangent. Imagine my surprise when I read this: http://en.wikipedia.org/wiki/Quantum_1/f_noise. They say that quantum origins of the observed power spectrum are not so easy to derive. After careful inspection, the above expression for the average kinetic energy of a quantum oscillator gives for the wrong limit of high (temperature), where quantum effects are negligible. To see this, note that the hyperbolic cotangent has the following expansion around : , which is dominated by , when the ratio is much smaller than (i.e. for large temperatures , since the atoms we study have fixed frequency of oscillation ). This entry was posted in Reflections, The expert's corner, Theoretical highlights and tagged colors, fashion, noise, sci-fi by hmmmjenia. Bookmark the permalink.